The Blessed Sacrament is present in the Chapel. 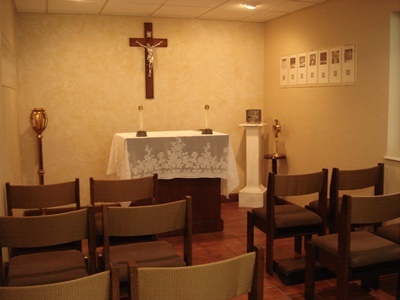 The Chapel is open for quiet prayer during Office hours (Monday – Friday, 9:00 a.m. to 4:00 p.m.). Exposition of the Blessed Sacrament is on Tuesdays, 9 a.m. to 12 p.m.; and Fridays, 9 a.m. to 4 p.m.
Two people are usually present in the Chapel at all times during adoration. Adoration in the Chapel is silent. Our ministry is made up of parishioners who commit to a specific hour each week. Contact the Parish Office if you are interested in volunteering.